Object feature extraction derives one feature vector for each object identified in the original data set. Typical use-case is image-based object recognition task such as defect detection. Original image is first processed by local (region) feature extraction. A local classifier is then trained to distinguish e.g. object/background or detecting a defect. When applied to a new image, each pixel is assigned to one of classes of interest (e.g. object/background). In the second step, the decisions are spatially segmented using connected component analysis. Each object (connected spatial area) is then represented by a set of features and an object-level classifier is build. This helps us to distinguish objects based on content (original local features) or shape. This chapter concerns derivation of object-level representation using sdextract command. We will use dice data set. 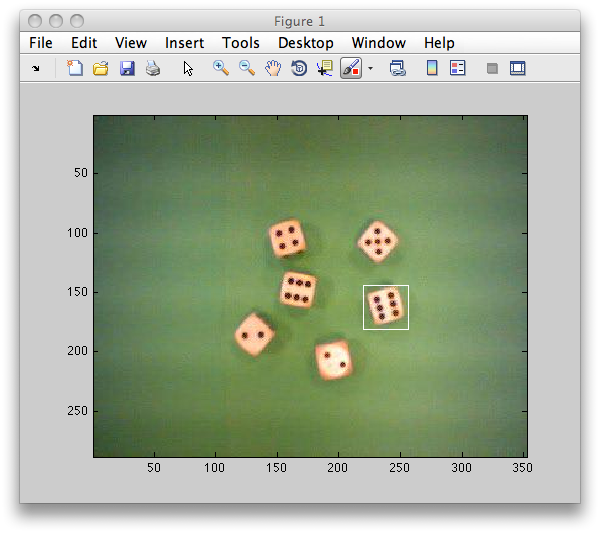 We save the labeled image back to Matlab workspace into variable I by pressing 's' key or via Image menu / Create data set in workspace. >> Creating data set I in the workspace. 1 Gaussian model          3x1  full cov.mat. 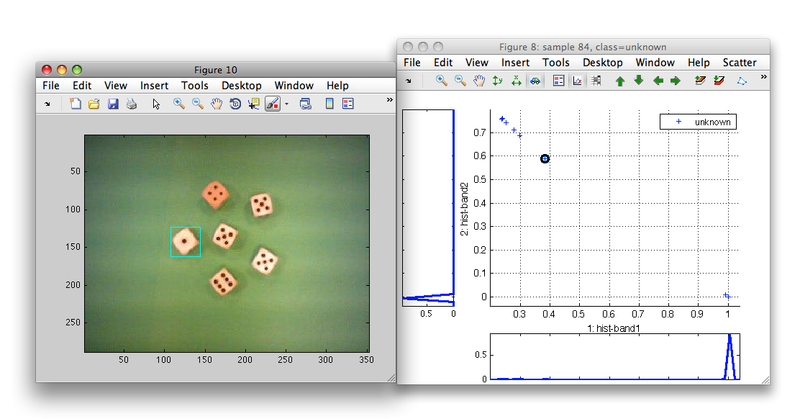 We will set the detector operating point to allow some errors in the background, rather that having holes in the dice. By pressing 's' we can save the setting back into the pd detector pipeline. We will segment the objects based on decisions with "Image" / "Connected components" / "Find connected component" command. >> Creating data set A in the workspace. 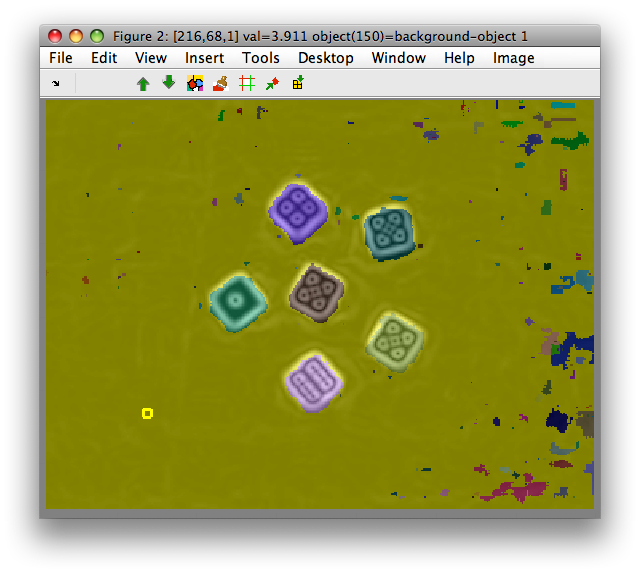 The object labels group pixels corresponding to each spatially connected object. For general syntax of sdextract, look here. The mean object extractor computes one mean vector for each object, defined by 'object' labels. In our RGB image example, this corresponds to mean color information. 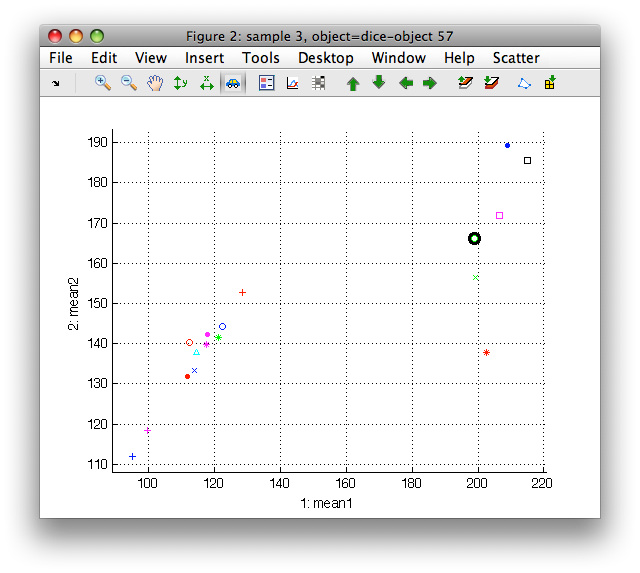 We open the extracted data set obj in scatter plot. 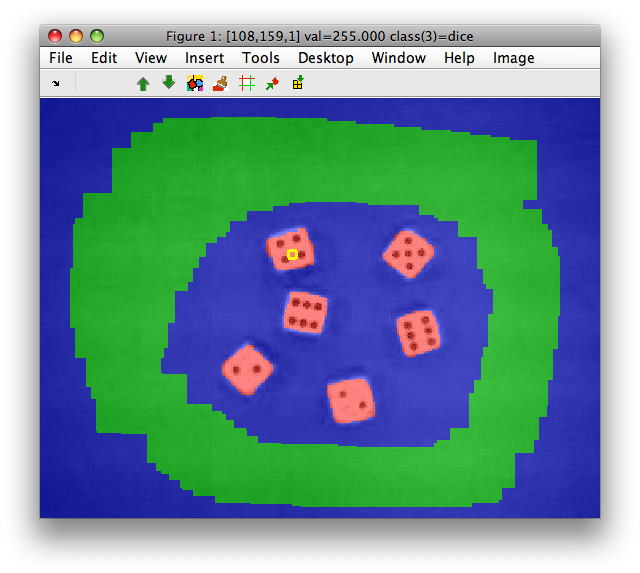 We can observe that a set of dice objects is separated from green background (change to 'object' labels in 'Scatter' menu). 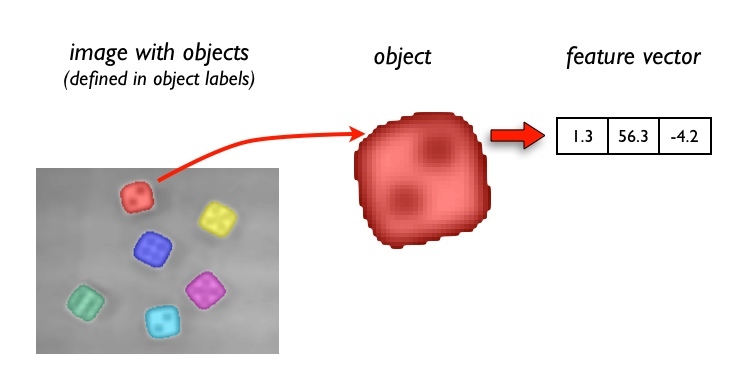 The object-level classifier would be then trained on properly labeled data set obj. 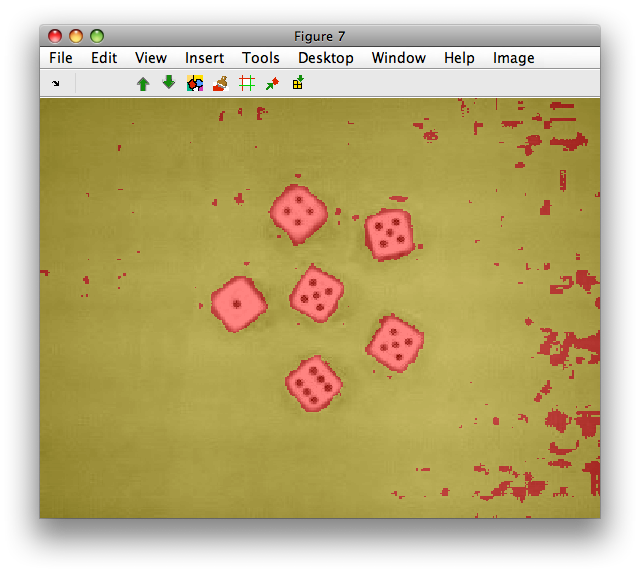 In this example, we separate dice objects from background regions based on their strong gradient structure. We characterize it by a per-object histogram of gradient. For more details on local filter features, see this chapter. Therefore, we extract per-object histograms, bining the values into three output features (very low, middle and high gradient). We obtain one output feature vector for each of the 167 connected components in the data set S.
The dice objects are having small probability of low gradients (1st feature) and high probability of middle gradients (2nd feature). The segmentation islands in the background fall into high probable area on the first feature. When extracting features per object with sdextract, it is often useful to copy object-related meta-data into the output set. Only sdlab label sets may be copied, not general meta-data. Note, that label set may be copied to object data set only if a value is always unique in each object (otherwise, the single per-object value would be undefined). 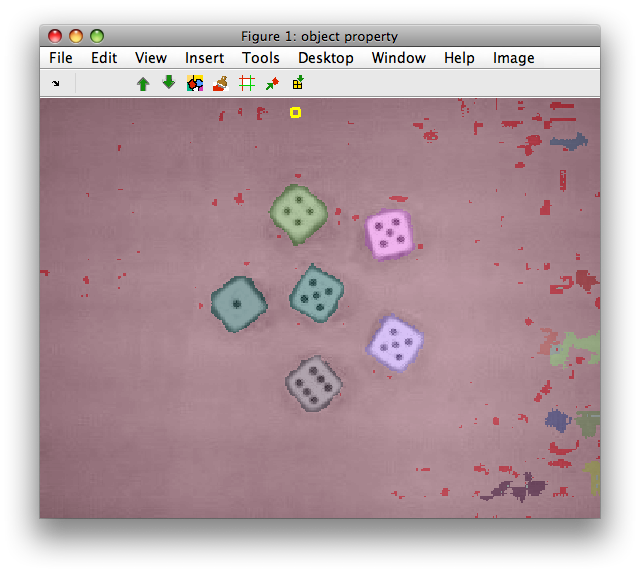 In our example, we're lucky as the dice/background 'class' labels are always unique in any connected object found. sdextract adds to each extracted per-object feature vector a new 'bbox' meta-data containing information on a object bounding box in the original image. The information is stored in the [row column height width] format where row and column correspond to the upper left corner, respectively.